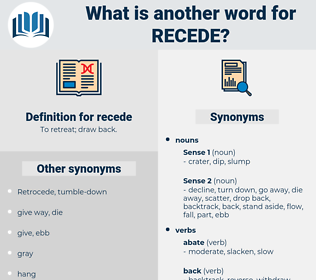 What is another word for recede? enhance, revive, magnify, extend, intensify, prolong, amplify, rise, enlarge. stretch, lengthen, dilate, spread, expand. strengthen, enter, begin, meet, continue. brazen, beard, outbrave, build, dare, blow up, swell, distend, mount, emerge, increase, face, show up, soar, defy, wax, brave, confront, elongate. But as the scholar grows older and more able to travel, so does the Pennine Range recede from his vision, until it becomes almost as remote as those crater - strewn mountains in the Moon which have a name so similar. At last the lights of the quay began to recede. 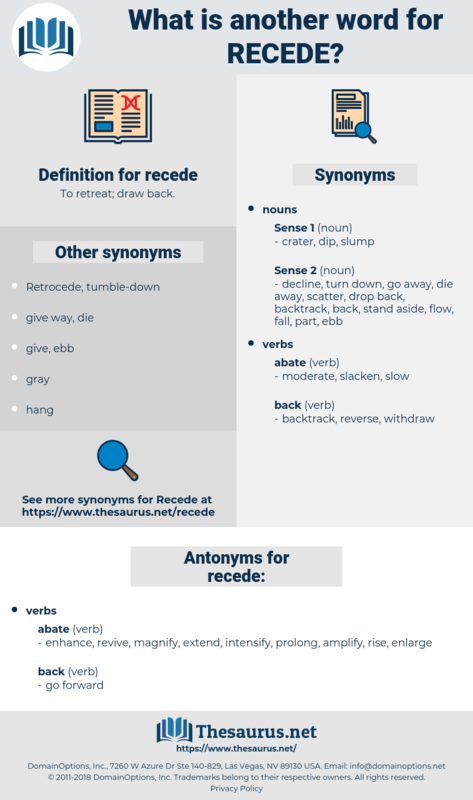 react, rushdie, reshoot, reseed, rig out, reside, recast, reset, rusty, racket, rushed, restate, restitute, rogue state, resuscitate, recto, rockweed, rheostat, rose-cheeked, rickety, rare-roasted, risotto, reseda, rachet, resid, Rico Act, ragged, rescued, rosy-cheeked, resist, razed, rough cut, rackety, richweed, rugged, rocket, rigidity, rough out, racquet, ricotta, residue, roughcast, rasta, rhizoid, rouged, rajidae, rested, roasted, request, rosewood, recode, rough-cut, resect, requite, roughshod, Rasht, roseate, requiescat, rigged, right-eyed, rust, rossetti, rau-sed, roost, resuscitated, reject, rosette, reseat, res gestae, rosita, rosidae, racist, rejected, roget, rye ergot, rag day, rigout, rush out, raised, right away, rigid, Resht, roast, rest, ricochet, right, rock-steady, ragweed, requisite, regicide, regatta, ragout, recessed, reach out, rusted, rectitude, requested, russet, roquette, rest day, recite.